Anatomically, the right ureter is affected, and the retrocaval segment is located dorsal to the vena cava as it travels down from the kidney to the bladder. The retro-caval ureter can either encircle the cava by crossing it ventrally from medial to lateral before reaching the bladder or simply lie dorsal to the cava for a segment without wrapping around the cava completely and end in the bladder distally. In both anatomic forms, the retrocaval ureteral segment is susceptible to proximal urinary obstruction as the ureter takes this tortuous "reverse-J" or "S-shaped" course down to the bladder. When obstructive symptoms of flank pain or renal parenchymal loss develop, surgical repair is indicated. The principles of repair with the laparoscopic approach are similar to those of open surgery. The retrocaval ureteral segment has to be mobilized to a location anterior and lateral to the cava. When the ureter encircles the cava, dismemberment with reanastomosis is needed. When the ureter does not encircle the cava, a simple ureterol-ysis may be sufficient. Baba et al. 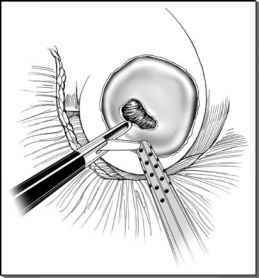 first reported the transperitoneal laparoscopic management of the retrocaval ureter in 1994 (1). Their success was subsequently confirmed by several other investigators (2,3). In the typical transperitoneal approach, cystoscopy is first performed with placement of a double J-stent in the ureter (1-3). The patient is then placed in a right lateral position with 45 to 70 degree of table-tilt to allow the ascending colon to fall away from the operative field. The camera port is usually placed at the umbilicus, and three working ports are placed at the ipsilateral mid-clavicular line subcostally, at the iliac fossa, and in the ipsilateral flank. The last port at the flank may be optional depending on the patient's anatomy (4). Following successful trocar placement and establishment of pneumoperitoneum, the white line of Toldt is incised, and the ascending colon is mobilized and reflected medially. Upon entering the retroperitoneum, the ureter is mobilized with sharp and blunt dissection. Once mobilized, the ureter is transected just distal to the obstructive, circumcaval segment, and the ureteral catheter is withdrawn distally. If stenotic, the retrocaval segment is then excised, and the distal ureteral stump may be spatulated prior to reanastomosis to the proximal ureteral segment. In cases where the retrocaval ureteral segment cannot be freed easily from the cava, it can be left in situ after dividing the ureter both proxi-mally and distally to this segment. The proximal and distal ureteral ends are then brought anterior and lateral to the cava for reanastomosis with interrupted absorbable sutures over the ureteral stent. In the end, a closed suction drain is placed in the retroperitoneal space, and a Foley catheter is left in the bladder for one to two days after surgery. The retroperitoneoscopic approach has also been used by several investigators with success (5-8). The patient is similarly placed in a modified flank position with a more exaggerated table-tilt. The surgical approach to ureterolysis, ureteral transection and reanastomosis to create a more anterolateral position for the ureter is similar to that for the transabdominal approach. The advantage of retroperitoneoscopic approach compared to the transperitoneal method is that bowel mobilization is minimized. In addition, the retroperitoneal approach avoids urinary spillage into the peritoneum, which may reduce the risk of subsequent intraperitoneal adhesion formation. The main disadvantages include limited working space (9). The first reported cases on laparoscopic surgical management of retrocaval ureter took 9.3 hours with the end-to-end ureteral anastomosis requiring almost 2.5 hours. The authors found that laparoscopic suturing of the anastomosis was the most difficult part of the operation (1). Despite the long operative duration, the patient's recovery was uneventful, and he did not require any analgesics postoperatively. Although not commented on specifically, the patient remained in the hospital until postoperative day 9 and subsequent convalescence was "brief." With refinement in laparoscopic techniques, experience, and perioperative management, operative times have decreased in contemporary cases to 3.5 to 4.1 hours with the transperitoneal approach (2,4,9), and to 3.5 to 4.5 hours with the retroperitoneal approach (5,6). In either approach, patients do remarkably well after surgery with minimal postoperative pain and short convalescence. Ramalingam and Selvarajan and Gupta et al. reported the use of only nonopiate analgesics after surgery (2,5); while Polascik and Chen found that analgesics were not required beyond postoperative day one (4). Operative blood loss is insignificant in these cases, and patients now stay two to five days after surgery. The ureteral stent may be removed at four to eight weeks depending on the surgeon's preference, and follow-up nuclear drainage studies may be obtained afterwards to evaluate drainage. In the hands of experienced surgeons, operative time today is approximately four hours. Both approaches are well tolerated by patients with minimal blood loss and little need for postoperative analgesic beyond several days. Most investigators report a short convalescence, and patients are back to work in one to two weeks.